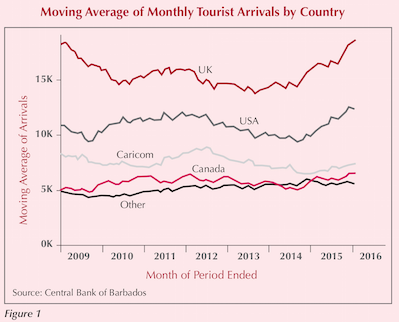 Figure 1 illustrates this resurgence, showing a 12-month moving average of monthly arrivals for the core markets. To give some context on the level of growth seen, the January 2016 number represents 26% growth for the UK, 15% growth for the US and 6% growth for Canada. The increased awareness and demand for vacation rentals, particularly from the US market, has seen that country close the gap on the UK, the segment leader in this sector, much more so than in the overall arrivals data. We can see this in Figure 2 which shows the percentage share of bookings by market for 2015, bookings made directly with Blue Sky Luxury, our dedicated Barbados holiday rentals brand. 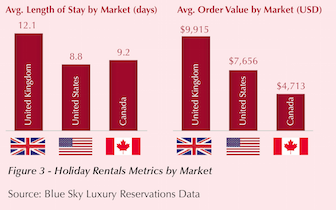 While the volume gap is closing, the UK continues to hold the advantage in some key metrics, in particular, the length of stay, which is significantly higher than the US. Looking at the average spend on a booking or the average order value, the difference persists. On another note, US visitors do spend more than their Canadian counterparts, due to the fact that the US visitor rents more of the luxury and super luxury ‘Flagship’ properties. Figure 3 illustrates these metrics. Historically holiday rentals have been an excellent source of high-end real estates buyers, and it follows that with the increased activity in the sector, that segment of the real estate market will experience an increase in demand. This article first appeared in The Red Book 2016.